Juglans Regia. 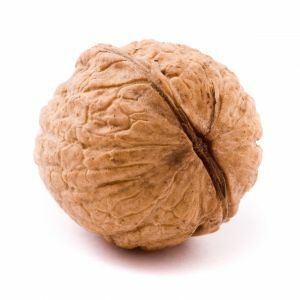 Walnut requires no description. The bark and leaves of the tree are very astringent. The husk and shell, and peal of the kernels, are sudorific, especially if used while the walnuts are green. It is said to expel the broad worms, or tape-worm. No insect eats the leaves of this tree. The leaves have the same property. The juice of the green husks, boiled with honey, is an excellent gargle for a sore mouth, and inflammation in the throat and stomach. The kernels when they grow old, are more oily, and therefore not fit to be eaten, but are then used to heal wounds, gangrenes, and carbuncles. The kernels burned are very astringent, and will stay women's courses, being taken in red wine. The green husks have the same effect. The kernels beaten with rue and wine, and applied, relieves the quinsy; and bruised with some honey, and applied to the ears, eases the pains and inflammation of them. The oil pressed out of the kernels, taken inwardly, is good for the colic, and to expel wind; half an ounce may be taken at any time. The young green nuts taken before they are half ripe, preserved with sugar, are good to strengthen weak stomachs. The distilled water of the green husks, before half ripe, cools the heat of agues; dose an ounce or two at a time. It is a very cooling application to green wounds, quickly healing them. The distilled water of the green husks being ripe, is very good against the quinsy, gargling, and bathing the throat with it.